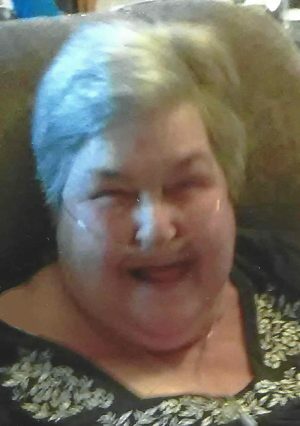 FULTON, NY – Theresa M. Salmonsen, 71, of Fulton, passed away on Sunday, September 9, 2018, at Oswego Hospital after a brief illness. She had worked as a sales associate for various retail stores. Theresa had a huge heart and anyone who met her was drawn to her fun-loving personality. The family wishes to thank Dr. Mandanas’ office and all of the staff at Oswego Hospital for their care and support. Surviving are her children, Tommy Walts (Vicki) of Tampa, Fla., Terry Moak (Ronald Roeting) of Andalusia, Ala., Tracy Cartwright of Paxton, Fla., Dale Hart (Pam) of Zephyrhills, Fla., Cori Welch (Mike Annal) of Oswego and John Salmonsen of Fulton; 11 grandchildren; and nine great-grandchildren; siblings, Roxanne Recore, Robin Hudson, Carol Lewis, Rose Carvey, Duke, Steve, Ronnie, Fred, Johnny and David Recore all of Fulton; many nieces and nephews. Calling hours will be held from 2 to 4 p.m. on Thursday, September 13, at Foster Funeral Home, 910 Fay St., Fulton, with services to follow at 4 p.m. In lieu of flowers, contributions are encouraged to the American Cancer Society.